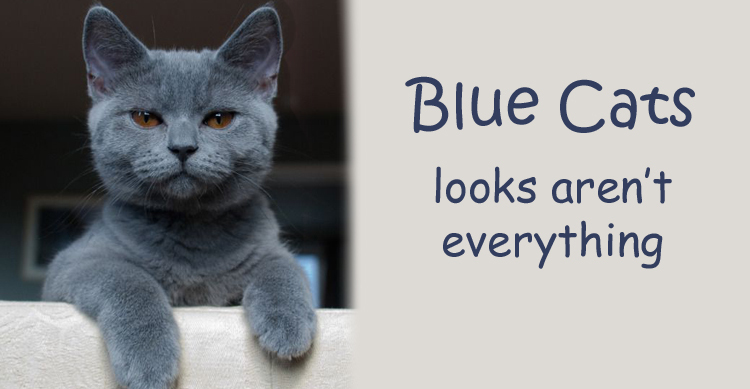 Are you interested in adopting a purebred shorthaired Blue cat as your next perfect pet? Because not all blue cats are the same! In Australia there are four main shorthaired cat breeds that are best known for their blue colour coats. While to the untrained eye they may look very similar, in reality they are quite different in size, in the texture and thickness of their fur, and importantly - in temperament and personality. The British Shorthair is the pedigreed version of the traditional British domestic cat. The most familiar colour variant is the "Blue" but the breed has also been developed in a wide range of other colours and patterns, including bi colours, tabby and colour point. This is a heavy set breed of cat with a distinctively round chunky muscular body and broad face with copper eyes and a medium tail. Their coat is short, thick, and very dense. 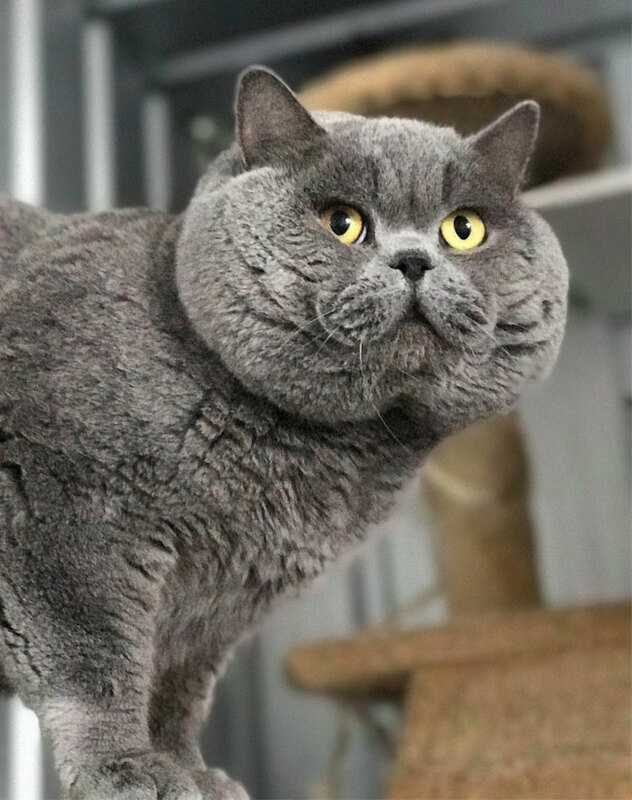 Regular brushing of the British Shorthair is important, especially during seasonal changes when the coat is thickening or thinning to avoid knotting. In terms of temperament British Shorthair cats are generally gentle, easy going and placid. They are quite playful when young but are also happy to entertain themselves and don’t require constant attention from their owners. British Shorthairs tend to be safe around children and will usually cope well with a fair amount of physical interaction. They have a stable character and rarely scratch or hiss. They are good indoor cats and take well to apartment living. The Burmese cat or Supphalak, meaning copper colour is a breed of domestic cat, originating in Thailand, and believed to have its roots near the present Thai-Burma border. The modern Burmese were developed in the United States and Britain. Originally, all Burmese cats were dark brown or sable in colour but are now available in a wide variety of colours including blue. Burmese are a medium size breed. They are strong and substantially-built muscular cats. The top of the head is slightly rounded, with wide cheek bones tapering to a short blunt wedge. They have ears of medium size, rounded off on the ends, moderately almond-shaped gold-amber eyes which often fade to a pale green as the cat matures. The Burmese coat is short, fine and glossy with a satin-like finish. In terms of temperament the Burmese are a notably people-oriented breed, active and curious when young, and often maintaining their kitten-like energy and playfulness into adulthood. They can be quite vocal but they have softer, sweeter voices than the Siamese. The breed is comfortable with children and dogs, and they can be taught to fetch and play tag. This is the largest of all the shorthaired breeds currently available in Australia. These gentle giants have large vertical ears and are born with blue, almond-shaped eyes that mature into their characteristic vivid green. Russians have slender, long muscular bodies which help to complete a picture of elegance. They have a plush double coat, again the consequence of originating in the cold Archangel region of northern Russia. The coat is in two layers, with a soft undercoat and longer outer hairs containing light "tipping", which gives the coat a lustrous sheen. The coat can be blue, black or white with blue the most popular. Russians can appear elegant and slim, although they possess a muscularity that effectively means they will often weigh more than their appearance might suggest. Sometimes reserved with strangers, they are invariably affectionate and love the company of their family. Despite their robust nature and strength, they are content to be couch potatoes but will always participate in play with children and dogs if socialised appropriately. 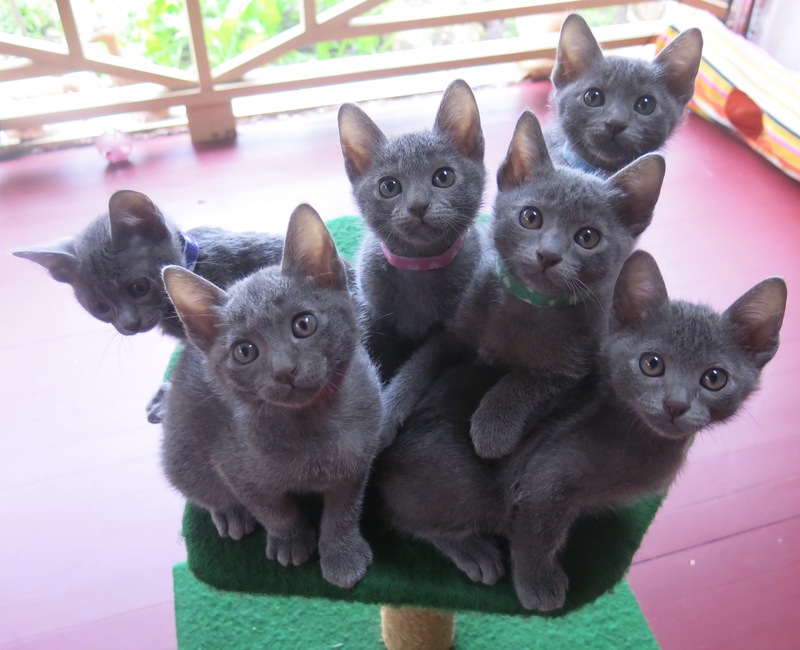 The Korat is a beautiful silver-blue cat that originates from the Korat plateau in Thailand. They are small to medium in size, muscular with smooth curved lines. A breed of great tradition and history it remains one of the few natural breeds of cat in existence today. Their coat is single, short and close lying, soft and glossy with no undercoat so shedding is minimal. They have a heart shaped face and large prominent green or amber green eyes and the eye colour intensifies as the cat matures. 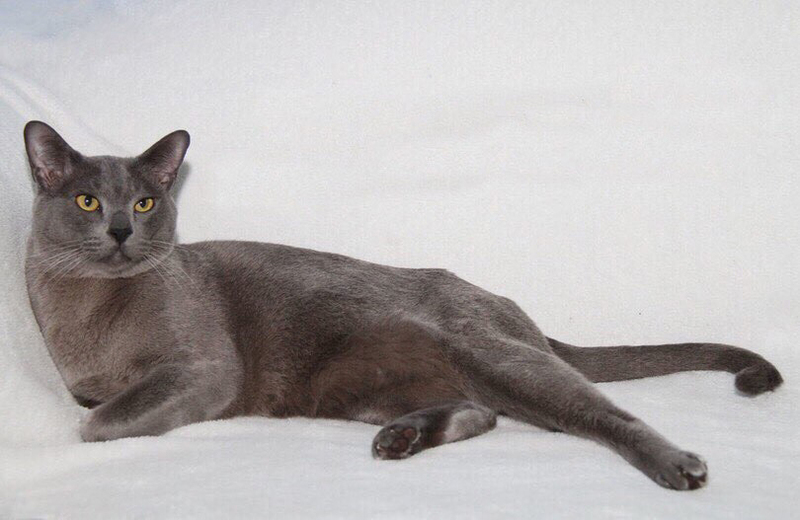 In terms of temperament the Korat is a very intelligent, agile, loyal, inquisitive and affectionate cat. They are wildly vigorous at play, always wanting to join in whatever activity is at hand. Korats love to be the centre of attention and constant participation and human companionship is important to them. Korats form a strong bond of affection with their owners and enjoy settling as close as possible. So which blue cat is right for you? If it's the stunning blue coat of these breeds that you've fallen in love with, the importance of understanding the differences in temperament is clear. 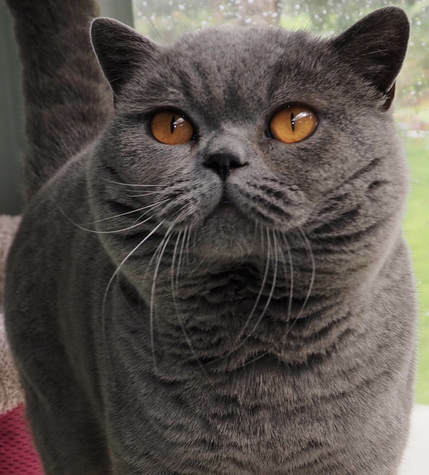 From the quiet and loving Russian Blue to the Korat and Blue Burmese which enjoy attention and play, overall the ever popular British Shorthair may be the most easy going of the bunch. So make sure you give good consideration to which blue cat will fit in best with your family and lifestyle - happy cat, happy household. Many thanks to Elaine Vincent: Ratchasima Korats & Eva Krynda: Doklao Korats for producing this great article for us. For comments also thanks to Maureen Stepanoff - Furreleda Cats, Anne Jones - Ancroft Cattery, Christine Belan - Cutekats Burmese, Dianne Dolman Brookside Burmese, Pam Veness - Uki Russians.